NYC plastic surgeon Dr. Thomas W. Loeb performs face lifts, brow lifts, neck lifts and other facial cosmetic procedures in his private office suite on the Upper East Side of Manhattan. You deserve to show the world your best face. Age, heredity, and other factors can take their toll, no matter how well you take care of yourself. Replenish your natural beauty and restore your youthful appearance with the many facial rejuvenation options offered by Dr. Loeb in New York City. In consultation with him, you can choose which facial enhancement procedures, alone or in combination, are right for you. A face lift eliminates prominent wrinkles, and removes excess fat and sagging skin, giving the face a more toned, youthful overall appearance. In his private surgical suite in New York City, Dr. Loeb will tighten the muscles underlying the skin, turning back the clock on the effects of gravity and natural aging. In many cases, patients choose to have a face lift performed as part of a suite of procedures, which may include an eye lift (blepharoplasty), neck lift, or brow lift, among others. For patients who exhibit hanging folds of skin in the neck region, or conspicuous bands of fat beneath the chin, a neck lift restores a more youthful, toned neck contour, while also accentuating the jawline. A mini lift, also known as a short scar face lift, is a face lift that is performed only on the lower third of the face, and is often done in conjunction with a neck lift. Bags under the eyes, as well as drooping skin, puffiness, and prominent creases in the eye region can all be eliminated with an eye lift procedure. Excess skin and fat is removed from both the lower and upper eyelids, giving the patient a smoother, more youthful frame around the “windows of the soul.” A blepharoplasty is often performed by Dr. Loeb in his NYC surgical suite in combination with other restorative procedures such as laser skin resurfacing, a brow lift, and skin bleaching to counteract dark patches underneath the eyes. Rhinoplasty, also known as a nose job, reduces, refines, or otherwise re-shapes the nose. Patients choose to have nose surgery performed for a variety of reasons—to remove a conspicuous hump or tip in the nose, to fix a deformity resulting from an accident, or to de-emphasize the prominence of the nose and create a more pleasing balance amongst other facial features. Dr. Loeb performs the surgery through incisions made in the nostrils. The nasal bones are usually broken and re-set to create a new shape, and to aesthetically improve the patient’s profile. Some people have chubby or excessively full-looking cheeks regardless of their overall weight or fitness level. Buccal fat removal may be the right choice for patients who want to give their face a sleeker, slimmer look, and give more definition to their jawline. The surgery is perfomed via a small incision in the mouth, after which fat from the “buccal pad” of the cheek is extracted. A sagging, wrinkled forehead and loose-hanging eyebrows can be returned to a more youthful firmness and freshness with a forehead or brow lift. The most common way for Dr. Loeb to perform a brow lift is to make small incisions on the scalp, through the hairline. Horizontal lines on the forehead are then smoothed out as a result of elevating the skin and underlying muscles. Excessive skin or fat on the upper eyelid may also be treated by an eye lift, or blepharoplasty. The shape and volume of cheeks can be augmented, and their definition and angularity dramatically transformed, through injectable fillers (such as Restalyne or Juvederm) or through implant surgery. The effect produced by fillers can last for anywhere between 4 months and 2 years, while cheek implants are permanent. Fat transfer, involving grafts prepared from fat cells taken from other areas of the body, may also be used to contour or amplify the cheek region. For patients who have a recessive chin or overly rounded jawline, chin augmentation can provide a more distinct definition to the face and create a more proportionate, aesthetically pleasing appearance. Small incisions are placed in the mouth or under the chin, after which the silicone implant is placed directly in front of the jaw bone. To achieve the best overall result, NYC plastic surgeon Dr. Loeb may perform this procedure in combination with others such as cheek augmentation, face lift, neck lift, facial liposuction, or rhinoplasty. Dermabrasion is a skin resurfacing procedure that erases facial imperfections such as scarring, wrinkles, or splotches. Outer layers of skin are cleared away, and the natural process of skin regeneration is stimulated. Other facial rejuvenation procedures that may be used in addition to dermabrasion include injectables such as Botox, laser resurfacing, or chemical peels. Individuals with oversized or excessively protruding ears can become self-conscious, socially withdrawn, and lose confidence because of their perceived abnormality. Ear plasty, or otoplasty, reduces, re-shapes, and re-folds the ears so that they no longer dominate a person’s face. The surgery, performed in Dr. Loeb’s private office suite in New York City, entails tiny incisions behind the ears, through which Dr. Loeb is able to manipulate and shift the ear cartilage to give the patient their preferred look. Dr. Loeb not only performs otoplasty on adults, but often on children starting at the age of 6 and up. Lip augmentation adds volume and shape to the lips through injectable fillers or implants. Patients choose to undergo lip augmentation due to issues such as thin lips, lines due to aging, asymmetrical lips, or lips that have been damaged due to injury. Though recovery time with implants is longer than with fillers (which may have a collagen or hyaluronic acid base, or which may involve fat transfers from other areas of the patient’s body), the results with implants are permanent. Face and neck liposuction removes excess bulges and lumps of fat from the cheeks, chin, jowls, and neck, giving the face a slimmer, contoured, younger appearance. Dr. Loeb places small incisions in inconspicuous spots on the face and neck, through which thin straw-like tubes are inserted. A suction vacuum is then used to extract fat cells. Patients often choose facial liposuction as a complementary procedure together with a face lift, neck lift, or brow lift. With aging, certain areas of the face can lose their youthful volume and become thin, creased, and hollow-looking. Fat transfer is a procedure by which fat cells are extracted from alternate areas of the body, such as the hips or buttocks, and harvested into “fat grafts” that can then be implanted into problem areas in the face (such as the nasolabial fold, the transition area between the nose and lower face) and elsewhere. These natural fat cells act as an injectable filler that smooths out wrinkled or creased areas and re-creates a fuller, more youthful complexion. Extracted fat cells can be frozen and stored for future use, as needed. Radiesse is a new injectable filler used to eliminate unsightly lines and folds in the nose, lips, chin, and cheeks. The advantage of Radiesse is that its results last longer than many other fillers, usually for 1-2 years. During a quick visit to his private office on the Upper East Side of Manhattan, Dr. Loeb injects the filler just under the skin surface; in many cases, a second treatment, utilizing only 25% of the initial amount, is required three months after the first. Fractora is a fractional skin resurfacing system that uses radio frequency waves to stimulate collagen development, eliminate fine wrinkles, and remove pigment irregularities, acne scars, or excessive redness of the skin. Fractora can be used on any area of the face, including the upper and lower eyelids, as well as cheeks, mouth, and neck. At his Fifth Avenue office in NYC, Dr. Loeb administers the radio frequencies through small pins placed directly against the skin. Outer layers of skin are ablated, and new skin growth is stimulated. Restylane and Juvederm are the gold standard of injectable fillers, which restore volume to areas of the face that have thinned and wrinkled, replenishing the skin to give it a smooth, fresh, youthful look. Both Restylane and Juvederm are natural, biodegradable, and non-animal based. 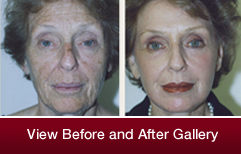 Dr. Loeb injects them just under the skin near the lips and nose, on the lower eyelid, or on the jowl or chin. The rejuvenating effect of these fillers usually lasts between 4-6 months. If you are interested in learning more about your options for facial plastic surgery in New York City, including any of the above-mentioned procedures, we invite you to call our Manhattan office at 212-327-3700 to schedule a consultation with Dr. Loeb.